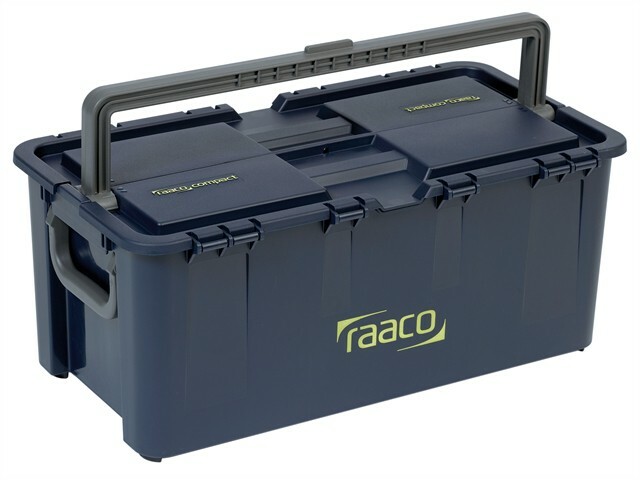 The Raaco Compact 37 toolbox has a functional design that is easy to handle. The spacious box is equipped with a split lid that opens, closes and locks by an internal locking mechanism. The intelligent design ensures that the lid lies flat along the sides when the Compact is open, thereby taking up minimal space. When the Compact is closed, the handle folds down and is completely integrated into the recess in the lid, ensuring that it can be easily stacked and also used as a foot stool. The long, ergonomic handle ensures proper balance at all times. It also locks into place to allow safe transportation. Inside, this tool box is equipped with a removable tray with permanent partitions and removable inserts that make it easy to set up varying storage solutions for small items and accessories. Dimensions: H x W x D: 230 x 540 x 296mm.